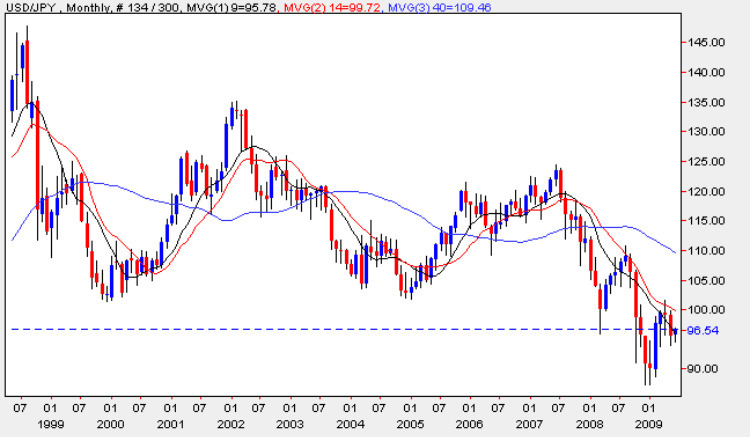 As we begin a new month I thought it would be apposite to review the progress of the yen to dollar currency pair and, in particular, to take a look at the monthly chart which should provide us with a different perspective on where we are in the overall trading cycle. Last month closed below the 9 month moving average ending on a relatively wide spread down bar which came as no surprise following the previous month’s long legged doji candle which almost always signifies a change of direction as indeed was that of January. As we can see the current trading range is relatively congested but, more importantly, is at the bottom of the dollar yen cycle where the 90 price point seems to be the definitive support level at present, not least because the interventionist Bank of Japan cannot allow the Japanese Yen to over strengthen and therefore damage Japan’s export market. This is one of the dangers of trading this pair and it is always a fine judgement to make, at what point does technical analysis end and the BOJ intervention begin and I would suggest that this price level is probably a trigger point. It can be very easy when analyzing the daily chart to lose sight of the bigger picture and the peak of 10 years ago where the dollar yen reached 145 does put the current price range into context. The current picture at present is bearish for the US dollar in the short term, not surprising given the market’s view of the US dollar overall, coupled with the perception and status of the Japanese Yen as a safe haven. In the short term we may see prices fall from the current level possibly to re-test the 90 price region or just above but it would not be a great surprise to see a rebound to re-retest resistance at the 100 level but only a strong weekly above here would suggest that a reversal has taken place. With little in the way of fundamental news on the economic calendar for Japan this week’s focus is on the US and details of these items can be found on the eurodollar site. In addition we also need to examine the dollar index for the market’s view of the US dollar and possible turning points in sentiment towards it.